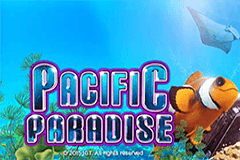 The beautiful world under the tropical ocean isfeatured in Pacific Paradise, apokie from IGT where brightly coloured fish swim against a coral reef and line up in 720 different ways to reward players with a prize. Plunging into the depths of this game, they will find lots of tasty extras, such as wild substitutions, a free spins game with richer reels and dual symbols of our fishy friends that can appear in big shoals of up to 10 for bigger payouts. This is an exceptionally good-looking game, where everything is rendered in a highly detailed style that’s almost photo-realistic. Unlike most pokies where the symbols are contained within clearly defined reels, these aquatic animals will simply spin against the waters surrounded by nothing whatsoever and for some reason they spin from the bottom up towards the top. Maybe it’s something to do with IGT wanting to give the effect that they were floating. Playable from 0.60 to 60.00 per spin, all parts of the game are permanently activated, so it can’t be played for just a few cents. Apart from the undersea setting, the first thing that’s going to be noticed is the way that the reels are arranged in a 3, 4, 5, 4, 3 format, meaning the outer reels are 3 symbols high, the next ones in are 4 high and the middle reel contains 5 symbols. Pacific Paradise has the popular Multiway Xtra setup, where winning spins are achieved by landing 3 or more of the same symbol type in any positions on adjacent reels, as long as the line starts on either the left of right-hand reel. If there are several examples of the winning symbol on a single reel, the amount won will be multiplied and if the entire middle reel contains that symbol, wins can be multiplied 5x over. Q, K and A playing card icons will pay just 5, 15 or 60 coins when stopping on 3, 4 or 5 reels at oncethen a blue tang (like Dory from Finding Nemo), and an angelfish are both worth 5, 20 or 60 coins, a clownfish, (Nemo) and triggerfish pay 10, 25 and 75 coins and then a yellow tang is valued at 10, 30 or 100. Each of the fish can appear in Dual Symbol format, where there’s 2 examples of the same type in a single position, and when they appear more than once on reel as part of a winning line, the multiplier is given an even bigger boost. The game title acts as a wild symbol, so whenever it’s possible, it will fill in the gaps between matching symbols to complete a winning combination, or extend lines across more reels for a bigger prize. To make it even more appealing, this wild can be stacked on the reels, and if it completes a line made up of any fish, it will act as another Dual Symbol, potentially multiplying the win several times over. A shoal of slivery fish is a scatter symbol that doesn’t need to be in any particular positions to be worth 3x, 20x or 50x the total bet, not just the coin value whenever 3, 4 or 5 swim into view at once. A group of orange jellyfish will award a free spins game, but there’s a bit of a sting in the tail, as they will need to land right across all 5 reels at once. Players are given an initial 10 games to play out, with extra wilds being added to the waters during this round, so they have a better chance of scoring some nice wins, while the 10 spins can be retriggered any time 5 more bonus symbols land. Beautiful symbols and some impressive animations lift Pacific Paradise above the waters. The fish in particular, are presented in great detail, but aside from how it looks, this is still a high quality pokie. The Multiway Xtra format effectively doubles the number of lines, as wins can run from either side of the game, while having more than one symbol on a reel when it’s part of a winning line can be a significant boost, especially if Dual Symbols come into play. Although 10 free spins isn’t a whole bunch, the extra wilds should help, and being able to retrigger them multiple times is a nice way to get some more wins. Even in the base game however, the combination of 720 ways to line up a win and the great design of this pokie makes it one that fish lovers should definitely dive in to.